The day was stiflingly hot. Hard sunlight beat down on my head, onto the cobbled rocks beneath my feet and the golden sandstone walls facing me, tall and imposing. I had to get inside, but there was only one heavily guarded door and the shuttered windows, while open, where too high off the ground. I wasn’t the only one who wanted to get inside the safety of the Palace, but as I glanced around at the motley collection of foreigners gathered beside me in the forecourt, I knew there was no chance of a unified assault. I was on my own. 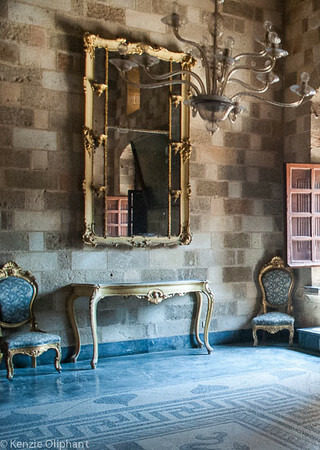 The Crusader Palace of the Grand Masters, in Rhodes town is a place that can set your imagination running wild. There are glorious arches, cavernous halls, imposing columns and dark, secretive undercrofts to satisfy even the most demanding castle-lover. But there’s more. 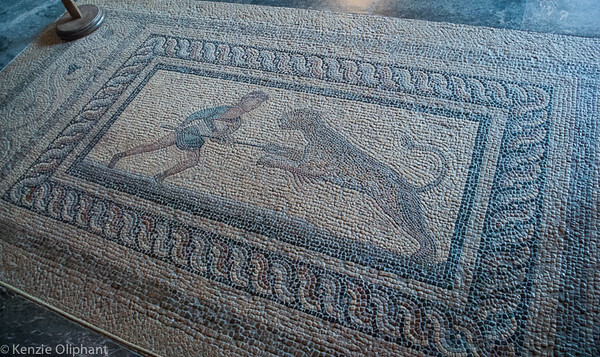 The sheer beauty of the Palace’s design and craftsmanship, the amazing open courtyard at its centre and the incredible collection of transplanted Hellenic and Roman mosaics on the floors of the formal rooms makes the Palace of the Grand Masters stand out all on its own as a fantastic destination. 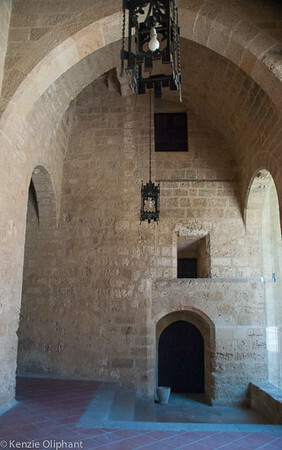 Apart from its fine rooms, displaying a blend of Byzantine and Renaissance elements, the Crusader Palace of the Grand Masters is also home to a decent museum showing artefacts from Christian times up to the capture of Rhodes by the Ottoman Turks in 1522. It was put together to celebrate the 2400th birthday of the city! In the museum you will find examples of local glassware, jewellery, pottery, weapons and statues, presented to highlight aspects of ordinary life throughout the periods. As an added bonus, the museum rooms are all air-conditioned, making them very pleasant to wander through in the high heat of summer. As a fiction writer, I’m often asked where I get my ideas from. While that’s an impossible question to answer, I will say that places like this provide an abundance of inspiration. 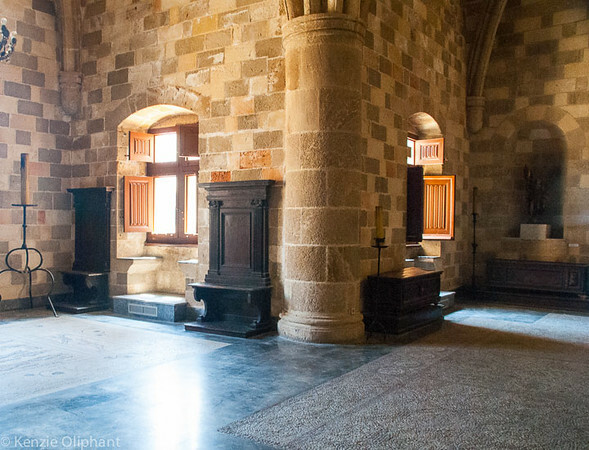 I take the time to find spots and simply sit for a while, allowing the atmosphere to soak into me, to try and imagine what ordinary life might be like in a medieval palace on Rhodes. In a way, I’m almost trying to hear the thousands of stories a building of this age would have to tell. Like all old things (myself included) the Palace of the Grand Masters has a long and gloriously chequered past which began before it was even built. The ancient Greek temple of the Sun (Helios) stood on the spot for centuries before the first castle was built at the end of the 7th century. 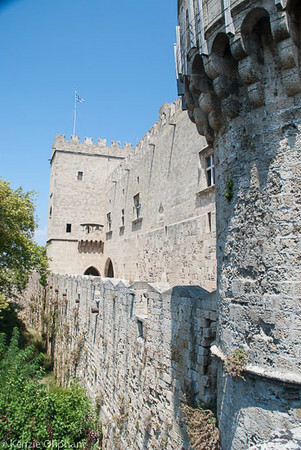 Successive invasions of Rhodes, an increase in port activity and wealth eventually brought the Knights of St John of Jerusalem in 1309 where they established a thriving city. 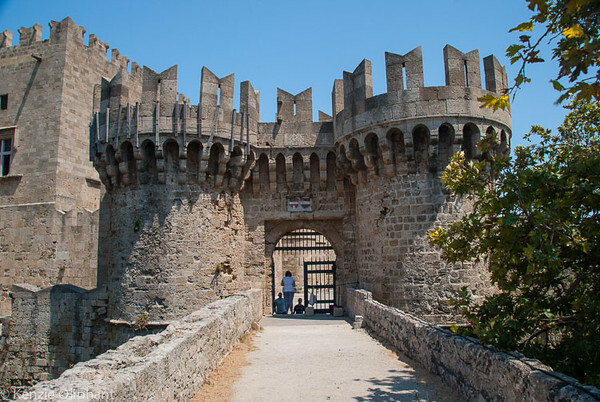 Rhodes became a primary launching place for journeys into the Middle East, whether for crusaders, traders or pilgrims and the Knights carefully and lucratively managed it all. Money flowed into the city, prompting a huge building program that quickly transformed the old city into something we would recognise today. Of course, as the crowning glory, the Palace became a magnificent example of the wealth and power of the Order of Knights of St John and subsequent rulers. 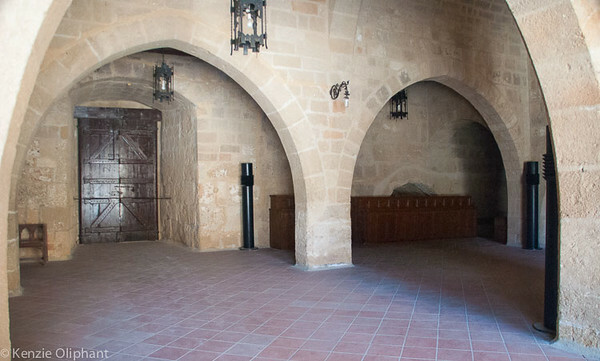 For two hundred years, the Knights ruled until the Ottoman Turks invaded in 1522 and turned the Palace into a garrison and prison. The Palace was damaged by earthquakes in 1851 and 1856. 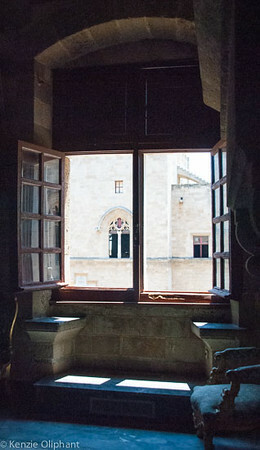 Once Rhodes was liberated by the Italians in 1912, several programs of rebuilding restored the Palace to what we see today. Like many orders created during the Crusades, the Knights were a religious order, made up of three distinct social and functional groups. The knights were drawn from the nobility of European Catholic countries, and the Grand Master was elected from among the knights and held office for life. 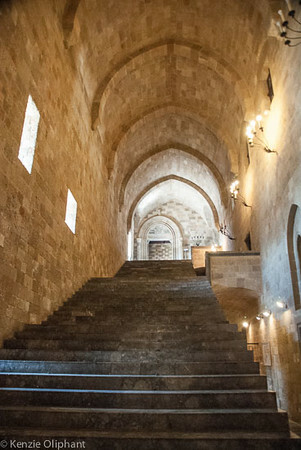 Beneath the knights were chaplains, then the serving brothers, who took care of the sick. The Grand Master was responsible for the administration of the order, helped by a council (Chapter) made up of the leaders of the various “Tongues” within the order. The Tongues were lodges of knights grouped together by their common languages. 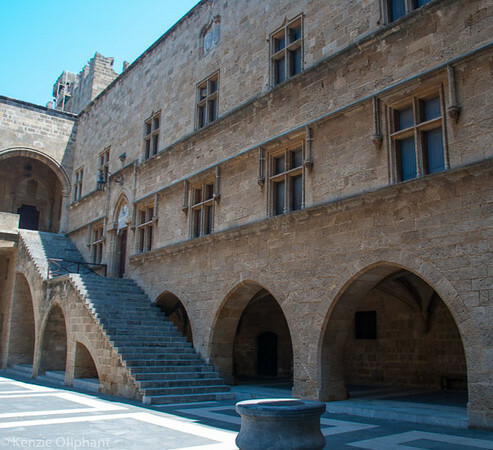 Each Tongue had a large lodging house in the Street of the Knights in Rhodes town, at the top of which is the Crusader Palace of the Grand Master. 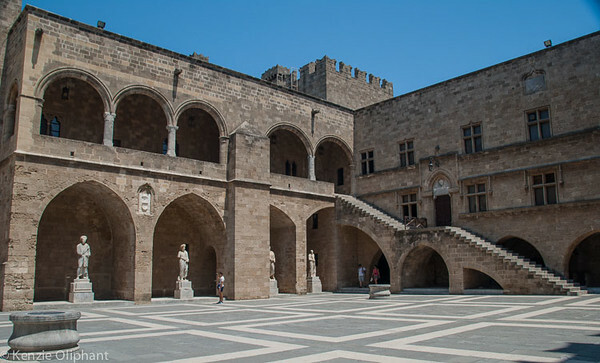 The Knights also built and ran a large hospital which is situated at the bottom of the Street and is now the archaeological museum of Rhodes. And yes. I offered the Gatekeeper 6 Euros, and to my great fortune, I was allowed inside to enjoy this magnificent Palace. Lucky, lucky me.